Together with Rehms Druck, B&F develop a new, extraordinary advent calendar every year for their customers. 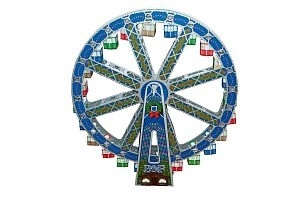 To top the past creations, this year the company really ventured to new heights by designing a calendar in the form of a true-to-scale big wheel that moves. Instead of the usual doors, the model that is completely made out of cardboard has 24 numbered gondolas – the “passengers” are chocolates. The model is customised to match the CI of the agency B&F and the form of the wheel. Numerous additional details are waiting to be discovered, which further underline the impressive overall appearance of the calendar that won a prize in the category Custom-made Designs. B&F installed a subsite on its corporate website to enable additional interaction and for personal address purposes, where a Christmas animation and a video demonstrating the construction of the calendar are posted. As well as presenting the recipient with a gift, the model that is produced from FSC-certified cardboard in a climate-neutral process is also environmentally-friendly.